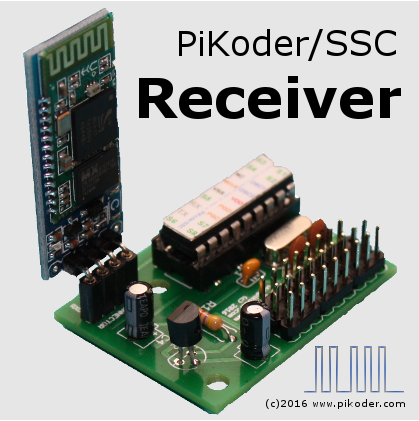 The PiKoder/SSC RX represents an eight channel bluetooth receiver module based on the PiKoder/SSC which has been designed as a replacement of the receiver in a R/C car. In concert with the picCAR-App you can easily control your model with your Android smart phone. Using the Arduino Digital RC for a broader and more professional feature set. The PiKoder/SSC RX features a wide range of power supply (4,0 - 6,5 V) thus allowing you to simply replace your models current receiver. The User's Guide provides detailed information regarding the features and the application of the PiKoder/SSC RX.